A new, tiny resident will now greet visitors to the St. Louis Zoo Primate House. 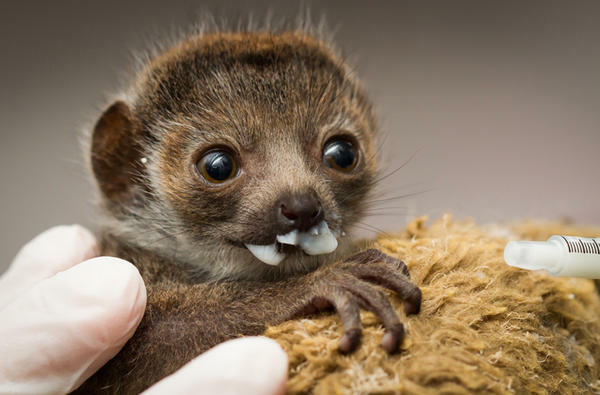 Princess Buttercup, a female mongoose lemur, is the first of her species to be born and reared successfully at the zoo. 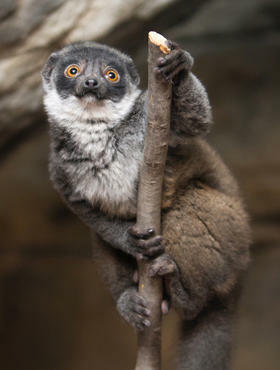 The critically endangered lemur species, which is found only on Madagascar, is the focus of a national cooperative breeding program intended to build a healthy population in captivity. Although staff members say the little lemur is now thriving, her first several weeks of life were challenging. Her mother, a 6-year-old mongoose lemur named Dahlia, was unable to nurse her. Soon after her birth, the staff began hand-feeding the baby lemur milk every two hours with a plastic syringe. A team of 11 staff members, including five full-time keepers, took turns caring for the baby. This often meant rearranging typical work schedules to accommodate the lemur’s feedings schedule. To ensure that she bonded with her mother, the baby lemur lived with her mother throughout the process. Despite being unable to nurse her baby, Whipple said Dahlia has been a model mother in all other respects, from cleaning the baby’s fur to keeping her warm. When she was first born, Princess Buttercup weighed about 2.4 ounces, about the same weight as two golf balls. Although she is growing quickly, she still weighs less than two pounds. Now that the baby lemur is nearly 4 months old, zoo staff will soon begin weaning her. Princess Buttercup won’t reach full maturity until she is about 2 years old. At that point, she will likely move to another zoo to start her own family. The St. Louis Zoo participates in the Mongoose Lemur Species Survival Plan, a breeding program coordinated by the Association of Zoos and Aquariums that seeks to build a healthy population of the endangered lemur species. According to the International Union for Conservation of Nature, mongoose lemur populations have dropped by more than 80 percent in less than 25 years. Slash and burn agriculture and unsustainable hunting are thought to be the main causes of the decline.